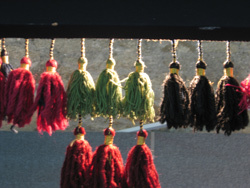 Look for us under the tassels in the Guilds & Organisations area. The Braidmakers' Workshop was formed in the mid-1990s. A handful of friends got to know each other through the Braid Society, and soon decided to go forth and share their passion for braids, cords and other "narrow wares", so that others might enjoy the fun of braidmaking, too. We teach braidmaking to anyone who will hold still long enough to listen. We also sell inexpensive kits to help people make the leap into braidmaking without emptying their bank account in the process. We're at the shows, and we have websites. Click our links below to visit and learn more! Arabesque Braids -- Freda Robinson has done remarkable work with the Knitting Nancy, using that simple tool to create elegant necklaces, fun toys and exciting trims (a far cry from the plain cord most of us used to make!) 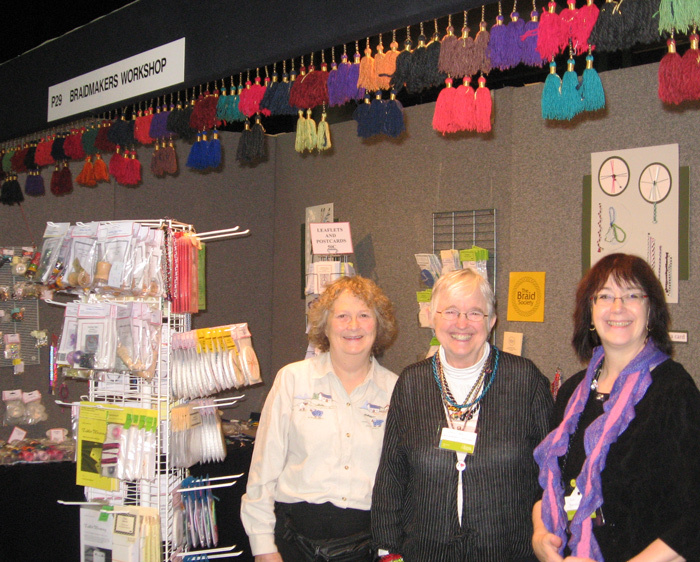 Besides the Knitting Nancy, she works extensively with kumihimo on a card (be sure to check out her firm plastic braiding disc) and with the lucet. Her website presents her work in all these areas and offers booklets, tools and kits to get you started, too. BerlinBraids -- Shirley Berlin pioneered ways to produce kumihimo on a simple cardboard disc and was one of the first to publish booklets in English for braiding on a card. Her website offers books and booklets, braiding, tablet weaving and lucet kits, braiding cards, weaving tablets, and information on the beautiful wooden marudais created by her husband, Peter. SpinningForth -- Ruth MacGregor came into narrow wares as a longtime handspinner, and her interests range from fill-the-gap braids to narrow woven bands. Smitten by the texture and handle of narrow weavings, she developed a small weaving loom after seeing it in a dream. That loom (the semi-rigid heddle) is available on her website, along with tablet weaving kits, spinning tools, silk-spinning kits and booklets. And where are we located? – Freda Robinson, with her pleasant Belfast accent, lives in East Sussex. – Shirley Berlin, originally from wind-swept central Canada, divides her time between Devon and British Columbia. – Ruth MacGregor hails from the Pacific Northwest, but is now an American living in France. In our modern world, wherever you may be, consider us right next door.